National defense is the hard case for the voluntary provision of public goods because without recourse to taxation it is difficult to overcome the free-rider problem, much less provide defense superior to that of government provision because of the large costs associated with national security and war-making. The theoretical explanations for how collective action problems can be solved privately generally have not been brought to bear on national defense, despite being applied to other public goods. I use the theoretical solutions to the collective action problem provided by Olson to understand the extensive private provision of national defense by Ukrainian citizens in their war against Russian-backed separatists. 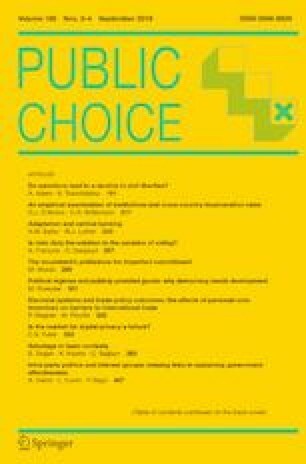 By reducing the size of the population in question and focusing on uniquely high return types of military capital, private defense charities attracted donations sufficient to supply critical funding and military materiel in places the Ukrainian government had failed to do so. I thank three anonymous referees, editors William F. Shughart II and Peter Leeson, Christopher J. Coyne, Bryan Cutsinger, Ennio Piano, and Linan Peng for their helpful comments. Akimenko, V. (2018). Ukraine’s toughest fight: The challenge of military reform. Washing D.C., Carnegie Endowment for International Peace. http://carnegieendowment.org/2018/02/22/ukraine-s-toughest-fight-challenge-of-military-reform-pub-75609. Army SOS. (2018). Reports. http://armysos.com.ua/zviti. Axe, D. (2015). Ukraine has lost half its warplanes. War is Boring. https://warisboring.com/ukraine-has-lost-half-its-warplanes/. BBC Monitoring. (2014). Ukraine: Army raises $1 m via text appeals for unds. BBC. http://www.bbc.com/news/blogs-news-from-elsewhere-26631775. Boeselager, M. (2014). Ukraine’s army crowdfunds over $2 million to use against Putin. Vice. https://news.vice.com/article/ukraines-army-crowdfunds-over-2-million-to-use-against-putin. Candela, R., & Geloso, V. (2017). The lightship in economics? SSRN. https://papers.ssrn.com/sol3/papers.cfm?abstract_id=3157100. Carrier Strike Group 10. (2018). Carrier strike group. Available at: https://www.public.navy.mil/AIRFOR/cvn69/Pages/CARRIER%20STRIKE%20GROUP.aspx. Center for Strategic and International Studies, Russia and Eurasia Program. (2017). The Ukraine crisis timeline. Center for Strategic and International Studies. http://ukraine.csis.org/index.htm#514. Charities Aid Foundation. (2013). World giving index 2013: A global view on giving trends. https://www.cafonline.org/docs/default-sochaurce/about-us-publications/worldgivingindex2013_1374aweb.pdf?sfvrsn=e215f440_4. Cohen, M., & Green, M. (2016). Ukraine’s volunteer battalions. Infantry. https://www.benning.army.mil/infantry/magazine/issues/2016/APR-JUL/pdf/16)%20Cohen_UkraineVolunteers.pdf. Come Back Alive. (2018). About the foundation. https://savelife.in.ua/about/. Cruicshank, M. (2016). Crowdfunding war: How Ukraine is building its drone army. Vocativ. http://www.vocativ.com/news/381033/crowdfunding-war-how-ukraine-is-building-its-drone-army/index.html. Daadler, I., Flournoy, M., Herbst, J., Lodal, J., Pifer, S., Stavridis, J., Talbot, S., & Wald, C. (2015). Preserving Ukraine’s independence, resisting Russian aggression: What the United States and Nato must do. The Chicago Council. http://www.thechicagocouncil.org/sites/default/files/UkraineReport_February2015_FINAL.pdf. Dorell, O. (2015). Analysis: Ukraine forces outmanned, outgunned by rebels. USA Today. https://www.usatoday.com/story/news/world/2015/02/23/ukraine-military-hard-pressed-by-russian-backed-rebels/23883435/. Fiore, N. (2017). Defeating the Russian battalion tactical group. Armor. http://www.benning.army.mil/armor/eARMOR/content/issues/2017/Spring/2Fiore17.pdf. Fisher, M. (2013). This one map helps explain Ukraine’s protests. The Washington Post. https://www.washingtonpost.com/news/worldviews/wp/2013/12/09/this-one-map-helps-explain-ukraines-protests/?noredirect=on&utm_term=.49e9dc411a76. Gorlov, D. M., & Korniesky, O. A. (2015). Volunteer movement: Global experience and Ukrianian civic practices. National Institute for Strategic Studies. https://web.archive.org/web/20160415001030/http://www.niss.gov.ua/content/articles/files/volonter-697e4.pdf. Grau, L. (1997). Russian manufactured armored vehicle vulnerability in urban combat: The Chechnya experience. Foundation of American Scientists. https://fas.org/publications/issue-briefs/. Higgins, A. (2018). In Ukraine, corruption is now undermining the military. New York Times. https://www.nytimes.com/2018/02/19/world/europe/ukraine-corruption-military.html. Hirst, T. (2015). A billionaire with his own private army has just been sacked in Ukraine. Business Insider. http://www.businessinsider.com/billionaire-tycoon-igor-kolomoisky-on-a-dangerous-collision-course-with-ukraine-government-2015-3. Holcomb, F. (2016). The order of battle of the Ukrainian armed forces: A key component in European security. Institute for the Study of War. http://www.understandingwar.org/sites/default/files/ISW%20Ukrainian%20ORBAT%20Holcomb%202016_0.pdf. Institute for the Study of War. (2017). The Ukraine project. Publications. http://www.understandingwar.org/publications?type%5B%5D=backgrounder&type%5B%5D=map&type%5B%5D=other_work&type%5B%5D=report&tid%5B%5D=300&field_lastname_value=&sort_by=created&sort_order=DESC. Jane’s Defence Weekly. (2017). Running hot and cold: The potential for a frozen conflict in Eastern Ukraine. Jane’s. https://www.janes.com/images/assets/966/75966/Running_hot_and_cold_The_potential_for_a_frozen_conflict_in_eastern_Ukraine.pdf. Klein, M. (2015). Ukraine’s volunteer battalions—Advantages and challenges. Swedish Defence Research Agency. https://www.foi.se/download/18.2bc30cfb157f5e989c3181f/1477482863677/RUFS%20Briefing%20No.%2027%20.pdf. Koval, I. (2016). I believe—I do not believe: Biotech-rehabilitation of the wounded. Forbes Ukraine. http://forbes.net.ua/magazine/forbes/1416285-veryu-ne-veryu-bioteh-reabilitaciya-ranenyh. Krushelnycky, A. (2017). Ukraine’s anti-corruption agency alleges fraud in arms industry. Foreign Policy. http://foreignpolicy.com/2017/12/21/ukraines-anti-corruption-agency-alleges-fraud-in-arms-industry/. Lapko, A. (2014). Ukraine’s own worst enemy. New York Times. https://www.nytimes.com/2014/10/08/opinion/in-war-time-corruption-in-ukraine-can-be-deadly.html. Lengel, E. (2017). Taming Chechnya. Historynet. http://www.historynet.com/taming-chechnya.htm. Ministry of Defence of Ukraine. (2015a). Support Ukrainian army campaign: MoD of Ukraine received UAH 160 mln 46 thousand. Government Portal. http://old.kmu.gov.ua/kmu/control/en/publish/article?art_id=248659804&cat_id=244314975. Ministry of Defence of Ukraine. (2015b). Support Ukrainian army campaign: MoD of Ukraine received over UAH 158,657 million. Government Portal. http://old.kmu.gov.ua/kmu/control/en/publish/article?art_id=248190219&cat_id=244314975. Ministry of Defence of Ukraine Facebook. (2014). Post on May 7th 2014. Ministry of Defence of Ukraine. https://www.facebook.com/modukraine/photos/a.1420185801565046.1073741828.1420141588236134/1432948886955404/?type=3&theater. Patrikarakos, D. (2014). The man who gave Ukraine’s army 1000 bullet proof vests. Mashable. https://mashable.com/2014/05/23/ukraine-military-donation-wings-of-phoenix/#52Jh9qwl2Pq1. People’s Project. (2017a). People’s project has been named a leader among charity initiatives again. People’s Project News Page. https://www.peoplesproject.com/en/news/peoples-project-named-a-leader-among-charity-initiatives-again/. People’s Project. (2017b). People’s project transmit high-tech equipment to snipers. People’s Project. https://www.peoplesproject.com/reports/peoples-project-peredaye-visokotexnologichne-sporyadzhennya-dlya-snajperiv/. People’s Project. (2018). Volunteers people’s projects are preparing the next transfer to the front. People’s Project. https://www.peoplesproject.com/reports/volonteri-peoples-project-gotuyut-chergovu-peredachu-na-front/. Peterson, N. (2017). Ukraine’s war against Putin-backed rebels is being undermined by corruption. Newsweek. http://www.newsweek.com/ukraines-war-against-putin-backed-rebels-being-undermined-corruption-649756. Piano, E., & Carson, B. (2018). Scalp-taking. SSRN. https://papers.ssrn.com/sol3/papers.cfm?abstract_id=3198404. Polyakov, L. (2012). Corruption obstructs reforms in the Ukrainian armed forces. In J. Derdzinski, & V. Klemenko (Eds. ), Alamac on security sector governance 2012, pp. 81–92. https://www.dcaf.ch/sites/default/files/publications/documents/Alman_bezp_2012_eng.pdf. Ponomarenko, I. (2017). Secrecy blankets corruption in Ukraine’s defense sector. Kyiv Post. https://www.kyivpost.com/ukraine-politics/secrecy-blankets-corruption-ukraines-defense-sector.html. Reuter’s Staff. (2017). Ukraine anti-corruption agency detains two senior defense officials—Prosecutor. Reuters. https://www.reuters.com/article/ukraine-corruption-defence/ukraine-anti-corruption-agency-detains-two-senior-defence-officials-prosecutor-idUSL8N1MM3OT. Ricks, T. (2015). The lessons of debaltseve: Armor vehicles still matter, but they need to be mobile, lethal, and survivable. Foreign Policy. https://foreignpolicy.com/2015/03/19/the-lessons-of-debaltseve-armored-vehicles-still-matter-but-they-need-to-be-mobile-lethal-and-survivable/. Roblin, S. (2017). Airborne fighting vehicles rolled through Hell in Eastern Ukraine. War is Boring. https://warisboring.com/airborne-fighting-vehicles-rolled-through-hell-in-eastern-ukraine/. Sefarin, T. (2015). Cost of war on Ukraine’s billionaires and the country. Forbes. https://www.forbes.com/sites/tatianaserafin/2015/03/02/cost-of-war-on-ukraines-billionaires-and-the-country/#3713d1f66a33. Torba, V. (2017). Victor Muzhenko: “There is a factor that the enemy did not expect. This is a Ukrainian character”. Day. https://day.kyiv.ua/ru/article/podrobnosti/armiya-voyna-ekzamen. Transparency International. (2014). Corruption perceptions index. https://www.transparency.org/cpi2014. Transparency International. (2017a). Corruption perceptions index. https://www.transparency.org/news/feature/corruption_perceptions_index_2017. Transparency International Defence and Security. (2017b). Excessive secrecy and weak planning undermine the effectiveness of international assistance in the defence sphere, new study. Transparency International. http://ti-defence.org/excessive-secrecy-weak-planning-undermine-effectiveness-international-assistance/. Ukrainian Freedom Fund. (2018). Homepage. http://ukrfreedomfund.org/en.